As reported, it needed various bug reports to Apple and updates of macOS 10.14 to finally offer a new version of nessViewer. The 32 bit version is no longer maintained (and this update is only available for the 64 bit version). The internet offer will also not be maintained anymore and probably removed in the future. Version 3.9 finally supports the dark appearance of macOS 10.14. 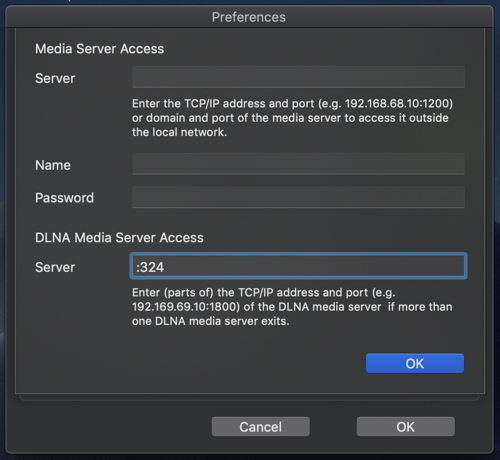 In addition, the server address of the DLNA media server can now optionally be specified in the preferences (tab: Center) and there at “Media Server” – even a part of the server address is sufficient. If the server address of the DLNA media server is e.g. 192.169.69.10:32469, then it is enough to enter “:324”.